...also... Study Guide available soon! We know that there will be a Christian revival. A revival will be born, because we obey Jesus’ first commandment to love the Father with all of our heart and soul. From the perspective of small children, we love our Father in Heaven. Hope for Neighbors instills compassion and helps us to obey Jesus’ second commandment to love our neighbors as ourselves. We must first love ourselves, as God loves us. 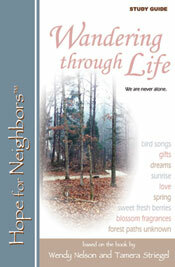 These principles are fundamental to the Hope for Neighbors series of seven books. People have realized that we are losing great names in evangelism and the waters have been muddied by new age teachings in churches. It is important to encourage readers to study the Word on their own and to apply God’s teaching as they make choices each day. Organized religion has begun to gravitate toward a “feel good” teaching – so readers leave the church. If we do not have a solid foundation in the Word, from the Bible, even the very elect will be deceived! Socially, we have a decline in morals and a decline in compassion toward our neighbors. The body of Christ has become divided by judgmental finger-pointing, when we know none are righteous and that we should be greeting our brothers in love. All problems in our nation come from sin sickness. All that sin is not making people happy and they are searching for more answers – and will turn to God. Right now, disillusioned people are leaving the church and they don’t know how to study by themselves. They need to hear the Holy Spirit, understand the Word of God and to use their gifts that they have been given! Everyone needs hope and to share the Word of God. Hope for Neighbors will encourage everyone across the nation - and the world! 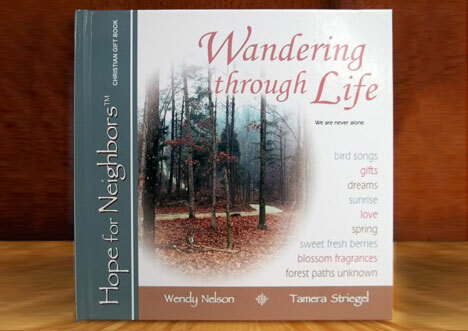 Hope for Neighbors "Wandering through Life" is a great gift book, but it is also a teaching tool and a way to share the hope of the Bible and bring Glory to God!